Even though William Steig’s original 1990 book is given credit, it’s really the 2001 animated feature upon which Shrek The Musical is based. And audiences wouldn’t want it any other way. Since its debut on Broadway in 2008, the show has become quite the theatrical industry. 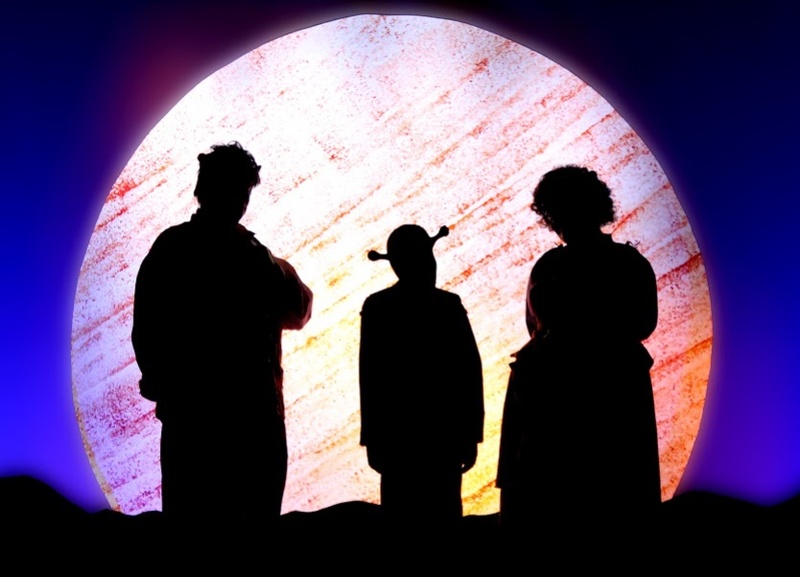 Various altered versions toured the globe; some of the jokes and fairy tale ensemble characters were re-written to appeal to local fairy tale lore, plus edited, scaled down productions were made available for youth theatre productions and schools. No two productions, wherever they were performed, were ever the same. 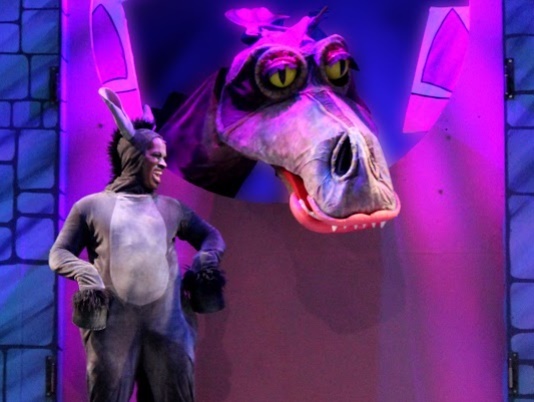 The version of Shrek The Musical now playing at Arizona Broadway Theatre in Peoria circles back to Broadway. With just a little tweaking here and there, including even a Trump reference, it’s the kind of big, brash, brightly covered, summer holiday gag-fest guaranteed to make family audiences feel giddy with delight as they leave the theatre with the biggest of grins on their faces and I’m a Believer circling like an ear-worm in their heads. Presented with its own fairy tale proscenium arch within ABT’s sizable stage, courtesy of Jim Hunter’s always colorfully pleasing set design, Shrek The Musical pretty much follows the same path as the original film. Many of the same jokes and situations are left intact – “Then in the morning,” declares Donkey (Deonte L. Warren), “I’m making waffles!” – but it all comes with a thoroughly pleasing Broadway flare, including the score. With book and lyrics by David Lindsay-Abaire and music by Jeanine Tesori, Shrek’s score is peppered with memorable hooks that intentionally borrow from other musicals, including Dreamgirls, Gypsy, a flag-waving moment from Les Miserables, and even Defying Gravity with that climactic, rebel yell from Wicked. Even clips of dialog from other mediums are thrown in for fun. When Shrek (Jason Simon) states, “That’ll do, Donkey, that’ll do,’ he’s quoting Babe. It’s like a free-for-all of quick-fire gags made all the funnier if you recognize the joke’s origin; and if you don’t, much like Rowan & Martin’s Laugh-In, there’ll be another joke just around the corner. But with all this self-deprecating, theatrical humor, there’s a moment when the show takes on a life of its own and it comes just before the intermission. When Shrek and Donkey sing with passion of Who I’d Be and then are joined by Princess Fiona (Liz Fallon) after she’s morphed into an ogre, the moment becomes pure Broadway as ABT’s orchestra, under Adam Berger’s direction, rises and voices soar. It brings the house down and leaves you breathless with the desire to get the intermission over with as quick as possible in order to get back to the show. Events that work in animation don’t always flow as well when presented in the flesh. Depending on where you’re sitting in the ABT’s vast auditorium not everyone is going to follow the demise of the show’s principle villain or understand what just happened. Plus, by insisting that the well-cast fairy-tale ensemble and their voices adhere as closely as possible to the film, actors can’t fully express themselves as they might want – it’s all in Lottie Dixon’s costumes and masks and Amanda Gran’s wigs – and the high-pitched squeals of certain characters echoing their movie counterparts can actually annoy after a short time when heard live. But that’s not an issue with the show’s four leads. 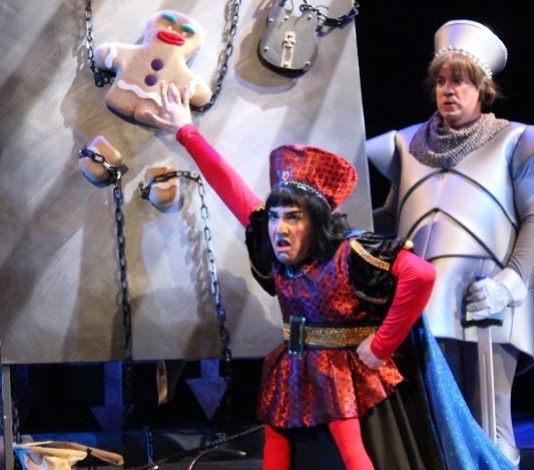 David Brumfield’s comically eye-rolling, broad delivery of the villainous and short in stature Lord Farquaad is continually laugh-out-loud funny. So, too is Deonte L. Warren’s motor mouth Donkey who plays his character less like Eddie Murphy from the film and more like a bug-eyed Little Richard in grey fur and hooves. Jason Simon, who scored so well with ABT audiences as Tevye in the recent production of Fiddler on the Roof, injects warmth, heart and humor as the ogre Shrek despite being buried under a ton of green makeup and thick costume padding, but it’s Liz Fallon’s Fiona that steals the show. With outstanding comic timing plus a soaring voice, not to mention a great dancer to boot, Liz’s personality fills the stage from wing to wing when she’s on. In this Shrek, Liz is a comedy musical dynamo and it’s easily her best ABT performance to date. Supported with lively choreography from Kurtis W. Overby, director Mace Archer has recreated the fun and energy of the original production and re-shaped it for the ABT stage. It’s not altogether great theatre. 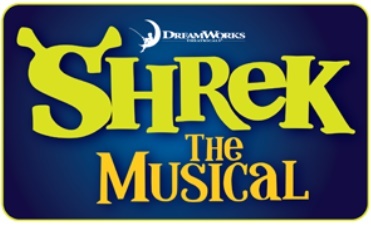 As with several film-to-theatre adaptations – Disney’s The Little Mermaid and Tarzan spring to mind – Shrek The Musical is another example of an American costumed fairy tale musical loosely resembling a seasonal European pantomime but without the audience participation. Though with Shrek, the connection of pantomime is even closer. 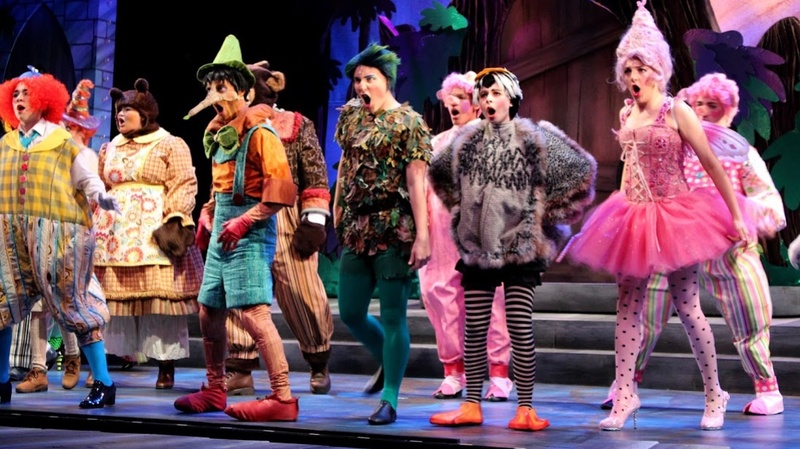 As pleasant as those Disney productions were, Shrek The Musical has a bigger advantage – it’s very, very funny.